The first thought that struck me, while going through it, was "Oh My God! How colorful it is!" I seem to have used practically all the main colors of the palette in FrontPage! And the background is a nice creamish yellow. And there are so many pictures throughout the website that you can't even go through it completely at one go... 'coz of the Geocities limitation on bytes download per day. Then I compared it with my current home -- the yellow versus the white, the bright reds-&-greens-&-blues versus the subdued shades of blue & gray -- and I thought to myself, "Yes! That's exactly the difference between the 'Kaddu' of then & the 'Kaddu' of today... not enough colors in her life now!" Thankfully though, I still have that old craze for pictures! Otherwise who knows... my own husband might not have been able to believe that the 2 sites could actually belong to the same person... Suri & Raj style in RNBDJ! Ha ha ha ha ha....! Even this screen-shot is looking so out-of-place here... on this blog! The Pic on the homepage is more of BEWARE or MESS NOT kind rather than WELCOME types.hahaha..but yea looks really good. 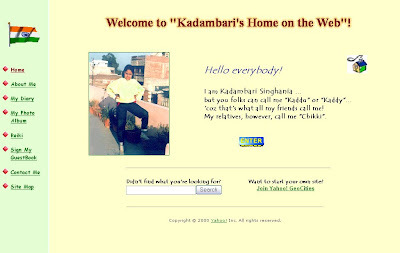 Made this website back in 2001-2002... before joining the BPO industry. Check out the section on Siddhuism in My Diary there. Shobhit: Dude! U still haven't posted YOUR link up on ur orkut profile! I want to see the similarities & differences for myself! Say... u & Ritesh G used to be real pals back in school, weren't u? And the 3rd one in ur group was Upmanyu I think ??? Well u need to send me the link to ur site... ASAP! I don't care if it's still under maintenance! I just HAVE TO SEE IT NOW!